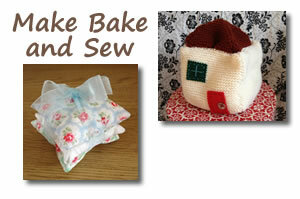 Make Bake and Sew is a lovely blog with helpful tips to make your own sewing crafts. Below are 2 sections guiding you through the few steps to make lavender bags and to make a hand knitted doorstop. These instructions are ideal for beginners or to teach your kids using small sewing/knitting patterns. *1kg of rice, dried beans or lentils. Cast on 28 sts in the cream arun wool. Knit garter stitch (knit every row knit stitch) for 56 rows. Cast off knit wise. repeat until you have 4 x squares. Cast on 28 sts in the brown wool. Knit garter stitch. cast off 1 stitch knit wise at the beginning of every other row until you end up with a triangle. Cast off last stitch knit wise. Repeat until you have 4 triangles for the roof. Make an inner bag for your filling be cutting out…click here for remaining instructions. Cut two 12cm x 12cm squares for each lavender bag you want to make. Pin the two together, right sides facing. On the sewing machine, sew round 3 sides using a straight stitch leaving a 1cm seam allowance. On the 4th side, sew half way across. This will leave you an opening so you can fill your bag. Turn right side out and…click here for remaining instructions.